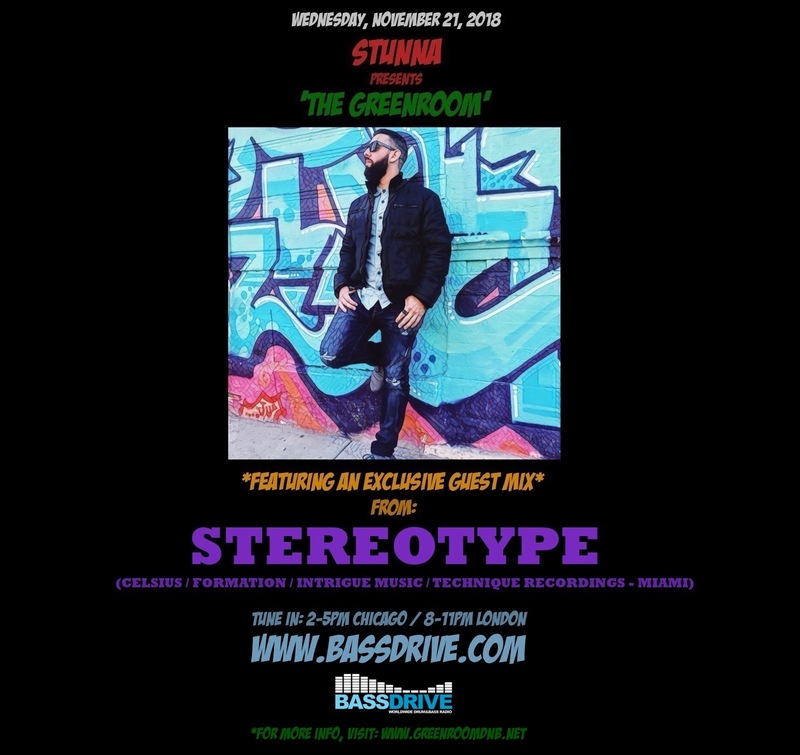 On WEDNESDAY, NOVEMBER 21, 2018, STUNNA unveils another special installment of 'THE GREENROOM' on BASSDRIVE Radio. In this session, we're treated to an exclusive guest mix from the talented producer and DJ known as STEREOTYPE. MIAMI, FLORIDA-based artist STEREOTYPE (aka GARY MONTOYA) has been deeply involved in the DRUM+BASS scene for many years. Whether releasing tracks for esteemed labels such as TECHNIQUE RECORDINGS, FORMATION RECORDS, and CELSIUS RECORDINGS, or promoting the successful 'STANK LOVE' club night in MIAMI, STEREOTYPE has always maintained a smooth and refined style in all his productions. With current and forthcoming original tracks and collaborations on INTRIGUE MUSIC, FLIGHT PATTERN RECORDS, CODE RECORDINGS, DRIVEN AM RECORDINGS, ALL STREET RECORDINGS, and SHEER VELOCITY RECORDINGS, STEREOTYPE's unique, soul-drenched music has found its way onto the airwaves via BBC RADIO 1 and MINISTRY OF SOUND, as well as garnered support from global heavy hitters such as FABIO, DJ SS, LOXY, DJ STORM, ATLANTIC CONNECTION, and RANDOM MOVEMENT. Join us this broadcast as STEREOTYPE drops a special guest mix showcasing his own sounds alongside some of his favorite tracks doing the rounds worldwide. Tune in!! *Also, ff you're in the ORLANDO area SATURDAY, NOVEMBER 24th, catch STEREOTYPE and more as DESTROY THE SPEAKERS ENTERTAINMENT presents "WELCOME TO THE JUNGLE" at PEEK DOWNTOWN (50 E CENTRAL BLVD).